When the reader first meets Iván the hotel owner in Daniel Peña’s debut novel, Bang, he is ruminating on all the reasons why his mother seemed to never let him outside into the Mexican city of Matamoros as he was growing up. “At first it was sun-exposure (too much of it),” Iván thinks. “And as he grew into a teenager, it was the gang violence she saw on TV. And as he grew older still, it was the general violence of Matamoros, which could be escaped but couldn’t be denied…”. This closing thought, “could be escaped but couldn’t be denied”, sat with me for a long while after reading. It very much represents some of the novel’s philosophies, as well as my own personal feelings, about the ongoing drug war in Mexico. 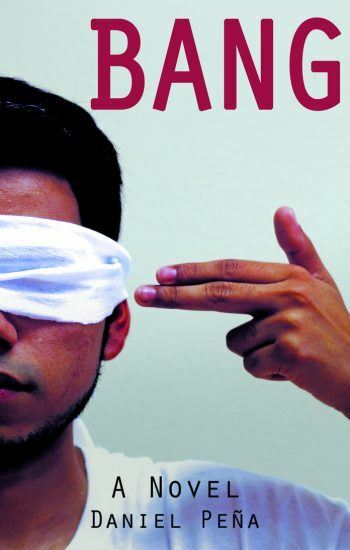 Bang is the story of two undocumented brothers, Cuauhtémoc and Uli, whose late-night ride in a crop duster turns sour when their engine gives out and they crash land on the Mexican side of the border. Having been brought to the U.S. as children and separated after the crash, Cuauhtémoc and Uli have no choice but to face the unfamiliar and violent world of border-Mexico alone. Each brother does what they must to survive. Cuauhtémoc becomes a smuggler for a drug cartel and Uli finds himself scavenging for copper wire in San Miguel, a city near-destroyed by the effects of the drug war. Both boys are struggling to make their way home to Texas, unaware that their mother has crossed the border to search for them. It’s these three characters that Bang follows, their individual plot lines each telling a story of an ordinary person doing incredible, sometimes haunting, things to survive. Peña does not spare any details when it comes to the nefarious actions of the cartels, the army purportedly fighting them, the autodefensas (vigilante groups), and those who are affected by the world drug trafficking has created. When certain details in the novel struck me as too gruesome to be true, I would remember Peña’s thoroughly conducted research (done through the National Autonomous University of Mexico) and I’d find myself second-guessing what I considered to be the limits of war and survival. The fact that Bang made me walk in between “trust the author” and “take everything with a grain of salt” speaks to my knowledge of the drug war and why Iván’s line about the undeniability of violence struck me so much. I have been studying Mexican history for ten years, our southern neighbor is my greatest passion, but the violence occuring there because of the drug war was something I’d been ignoring. I’ve been waving my hand at family members who would worry about my traveling there, saying, “it’s just like it is here: if you’re not involved in it you’re safe.” In a way that was my means of escaping a truth I wished I could deny: drug trafficking is real and it is heartless. And seeing as how the Mexican Drug War is a “low intensity” war, ongoing since 2006, I imagine Bang capable of igniting that same realization in the hearts of others who might have decided it acceptable to ignore. “Could be escaped but couldn’t be denied” is a looming stormcloud which hangs over the heads of Bang’s characters and slowly grows larger and larger as they become more entrenched in the lives they’ve crafted in Mexico. In Texas, Cuauhtémoc was trying to run from the memory of a freak accident that his cartel life asks him to repeat. He knows it would be easy to run away from the cartel in the plane the entrusted him with, but doing so would mean a lifetime on the run as well as putting his family in danger. Stuck in the decaying city of San Miguel, Uli could leave, but not without some deceit and cruelty on his part. And in the search for her sons, Araceli is pulled back into a country she abandoned some fifteen years ago. Faced with the violence of Matamoros, “home”, the thing the characters are all seeking to return to, becomes that escapable, undeniable thing for her. Despite the brutality and bleak inescapability I have been stressing, Bang is an honest and sympathetic novel concerning a family that has been torn apart. There is not a moment as one reads where a character comes off as unsympathetic or they wish for some comeuppance to befall them for the lengths they have resorted in order to survive. Exciting and thoughtful, I can’t deny that Bang is the most intriguing novel I have read so far in 2018. Bang by Daniel Peña was published January 30th, 2018 and is available from Arte Público Press.